The Holiday Inn Cape Cod-Falmouth Hotel is located in a beautiful country setting in historic Falmouth, just minutes to beaches including Old Silver Beach, ferries to Martha's Vineyard, downtown shopping, restaurants and six golf courses including Falmouth Country Club. The Holiday Inn, renovated in 2006, welcomes guests to enjoy our 98 rooms of charm in comfortable, modern accommodations. 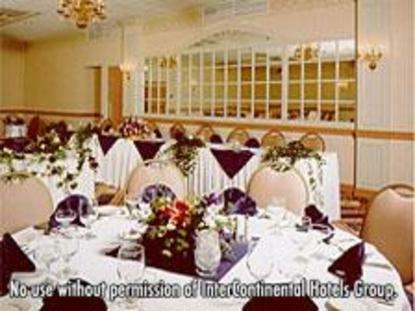 Two function rooms are available to accommodate events or meetings from 2-200. Relax in our indoor pool, or enjoy a meal in our Kansas City Steakhouse for breakfast or dinner. This hotel is committed to providing accessible facilities under the American Disabilities Act. If your accessibility needs are not met, please contact the Hotel Manager on Duty. Should you require additional information regarding accessible facilities for guests with disabilities, please call 1-800-Holiday (U.S. and Canada) or contact the hotel directly. For the hearing impaired, TDD service is available at 1-800-238-5544 within the U.S. and Canada.